Goose is now 4 years old and we have been walking together everyday now since he has been ten weeks old. Lately he has been getting bored due to the fact weekdays we walk the same area and the Adirondacks on weekends. So I thought I could make it more interesting for him by giving him a job and making him a working dog. For the last year has been locating and picking up cans and bottles along the road and carrying them in his backpacks. His title is IED-RD (Individually Ejected Deposit Retreival Dog). Now instead of being bored and sluggish he is energetic and ready to go. So now when we walk he locates and picks up cans and bottles along the road (Individually Ejected Deposits) and carrys them in his back packs. His title in his new career is Indvidually Ejected Deposit Retreival Dog. 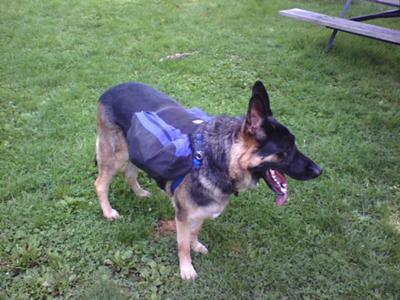 Plus he has made enough money to purchase his own frisbee, balls, flotation device for when we go fishing, and custom collar and harness and he even has a savings account in case he meets that special GSD someone! Dad still pays for his insurance and food though. Great story Michael. Thanks so much for sharing it with us. And what a cool idea too! Maybe this will inspire the rest of us to "get off our cans" - sorry I couldn't resist. You made him a true working dog, keep up good work with more skills like searching for a certain object. What a great idea! I'm sure Goose loves his new "job". He is a gorgeous male. You better watch him close because a female will be wanting that Stud. Take care Goose and he will take care of you.